We thought it might never happen, but it’s finally starting to feel like spring! To celebrate the season, we're cooking bright, lively dishes that we can share with friends over a few bottles of wine. Check out these four easy potluck recipes to bring to your next gathering. 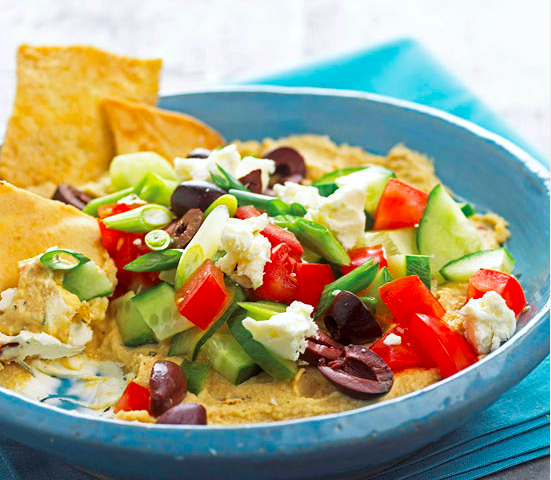 Better Homes and Gardens’ layered Greek dip will take center stage at your next spring gathering. Filled with fresh flavors and aromatic ingredients, including lemon, cucumber, tomato, Kalamata olives and feta cheese, this Mediterranean recipe pairs perfectly with pita and multigrain tortilla chips. The recipe yields 16 servings. Directions: In medium mixing bowl beat cream cheese, lemon juice, Italian seasoning, and garlic with electric mixer on medium speed until smooth and combined. Spread cream cheese mixture into a deep 9-inch pie plate, or shallow serving dish. Evenly spread hummus on cream cheese layer. Top with cucumber, tomato, olives, feta cheese, and green onions. Cover and refrigerate 2 to 24 hours. Serve with pita chips and/or multigrain tortilla chips. Eating Well creates a light version of this popular potluck dish, using reduced-fat mayo and yogurt to cut calories. 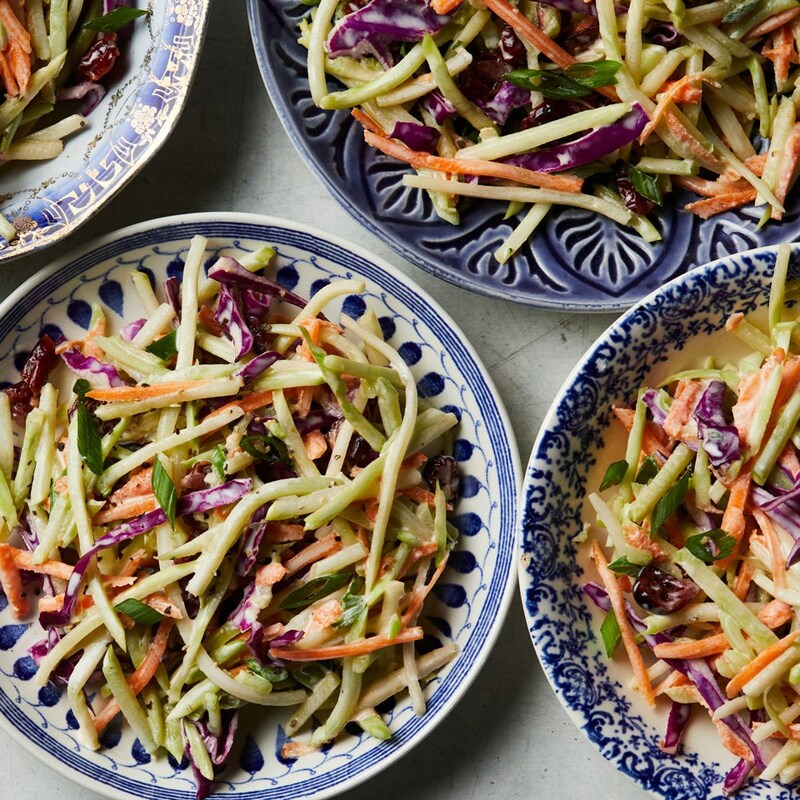 For quick preparation, pick up a bag of shredded broccoli slaw from your grocery store’s produce aisle, rather than chopping your own. Feel free to make this recipe, which yields eight servings, in advance; you can store it in the fridge covered for up to two days. Directions: Cook bacon in a large skillet over medium heat, turning frequently, until crisp, 5 to 8 minutes. Drain bacon on paper towels. Chop coarsely. If using whole broccoli, trim about 3 inches off the stems. Chop the rest into ¼-inch pieces. Whisk yogurt, mayonnaise, vinegar, sugar, salt, and pepper in a large bowl. Add water chestnuts, onion, bacon, and broccoli; toss to coat. Chill until serving time. 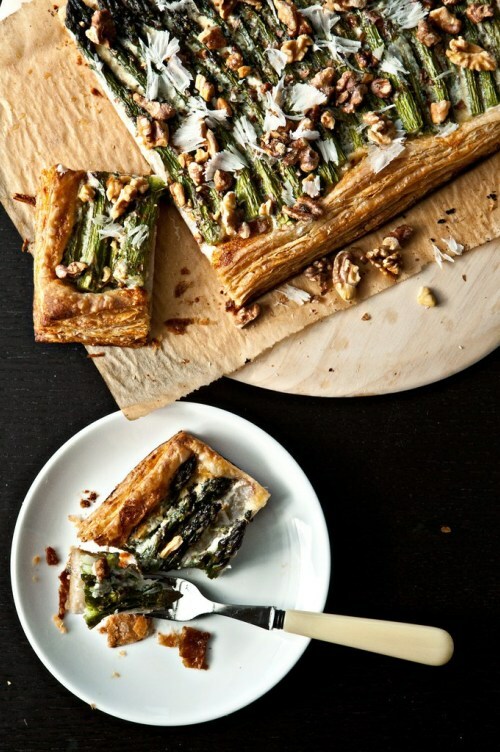 Consider bringing two of Not Without Salt’s asparagus tarts to your potluck party — we promise they’ll go quickly! Walnuts, asparagus, and Parmesan marry perfectly together, while flaky puff pastry gives them a tasty base. Garlic and chili flakes ensure this dish is bursting with flavor, and creamy textures due to the mascarpone. This recipe shows you how to prepare your own puff pastry, but you can cut down on prep time by using a store-bought version too. Directions: Preheat your oven to 420 degrees. Line a baking sheet with parchment. Roll the puff to a rough 8-by-12 inch rectangle. Trim off the uneven edges. Carefully place the puff onto the baking sheet and chill in the refrigerator for about 15 minutes while you prepare the rest of the ingredients. In a small bowl combine the Mascarpone, cream, garlic, pepper flakes, and a hefty pinch of salt and pepper. Remove the woody part of the asparagus by taking one spear and carefully bending until it snaps. Using that spear as your guide cut the remaining asparagus where your guide snapped. In a medium bowl toss the asparagus with 1 tablespoon of olive oil. 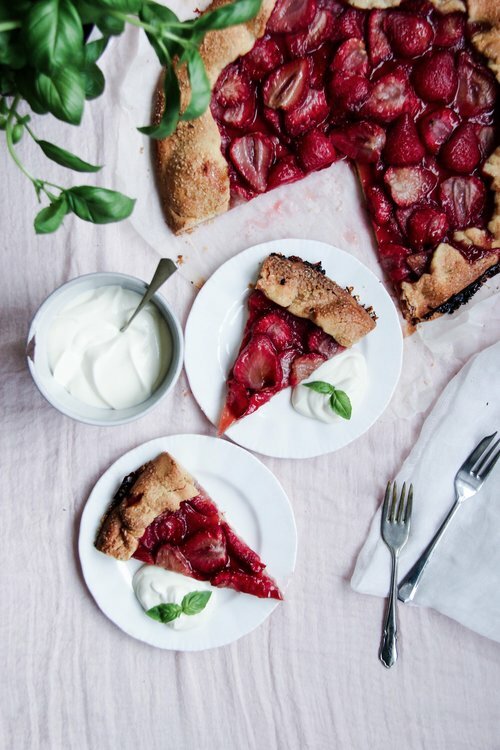 Nothing says spring quite like Williams-Sonoma’s strawberry galette with crème fraîche, the perfect sweet ending to any meal. It’s important to taste your strawberries after you’ve mixed them with the sugar, lemon zest, and vanilla bean, and you may need to add a touch more sugar, depending on how sweet you like your galette. For a truly decadent dessert, serve each slice of galette with a dollop of crème fraîche! This recipe yields 6 to 8 servings. Directions: Preheat your oven to 400 degrees. Line a baking sheet with parchment paper. Put the strawberries, the 2 tablespoons granulated sugar and the lemon zest in a large bowl. Using a paring knife, cut the vanilla bean in half lengthwise. Using the knife tip, scrape the seeds into the bowl. Toss well to combine, adjusting the sweetness with more sugar as desired. On a lightly floured surface, roll out the dough into a 14-inch round about ¼-inch thick. Fold the dough into quarters and unfold it onto the prepared baking sheet. Arrange the strawberries in the center of the dough, leaving a 3-inch border uncovered. Fold the edges of the dough over the strawberries, loosely pleating the dough and leaving the galette open in the center. Brush the dough with the egg mixture. Transfer to the oven and bake until the crust is golden brown and the filling is bubbling, 30 to 40 minutes. Transfer the baking sheet to a wire rack and let the galette cool on the sheet. Just before serving, dust the galette with confectioners’ sugar. Cut into slices and serve warm or at room temperature with a dollop of crème fraîche. Subject: LongIsland.com - Your Name sent you Article details of "Try These Four Spring Inspired Recipes"